Earlier in June 2013 I took part in a Cook For Family contest over at Daniel's Food Diary, and I won a Healthy Culinary Adventure class (worth more then SGD100) at Creative Culinaire! 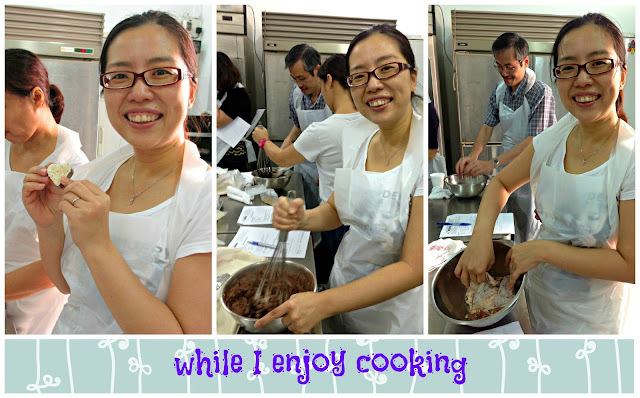 I am feeling very excited about it as this will be my first culinary class. I was paired up with the other winner from Daniel's contest, the very young and very pretty Jasmine~ We hit off quite fast, I am glad she does not mind the company of this talkative auntie who sometimes disappeared to attend to his 7 year old boy leaving her to listen to our instructor and handling some of the work. Jasmine has been baking since many years ago, she has a facebook page Bake A Dough where she hold frequent sprees for baking supplies and ingredients. 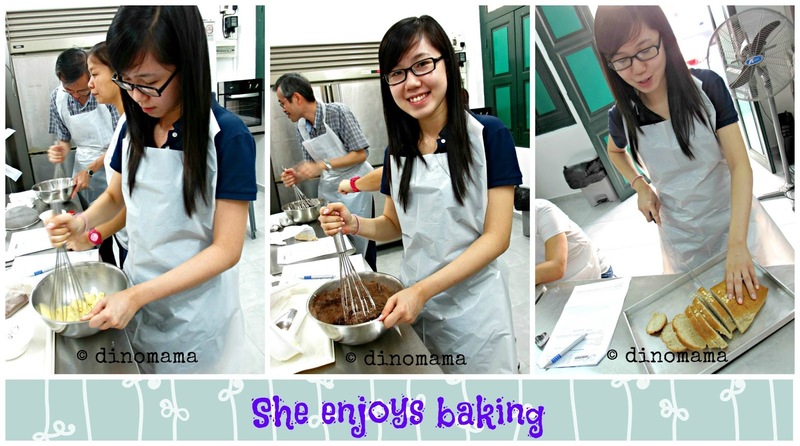 She has been baking so much that I think she is going to be my baking inspirations, I may have to bug her for advicse soon. Why did I say we are a perfect match? Well, she did the piping and bread cutting job coz I do not know how to do that while I season the chicken as she does not like the smell of chicken. Our very patient instructor Christine shows us every steps in details, explaining each step clearly and telling us correct ingredients to get from the supermarket should we decided to make this at home as the school buy their ingredients in bulk and some are not available in the supermarket. 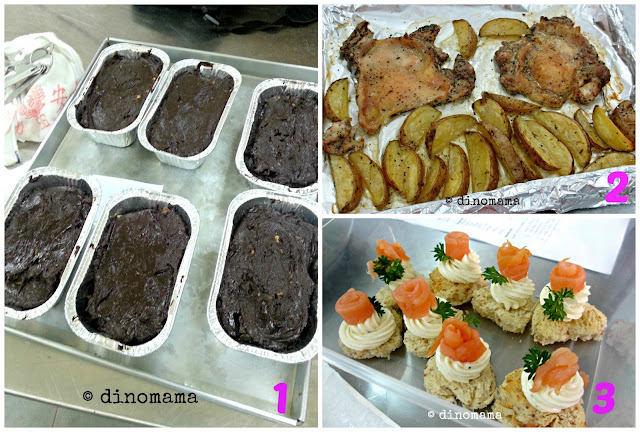 In just 4 hours, we were able to make the following delicious food. They are really simple and easy to make, I like the roast chicken and will most likely do it as weekday's dinner. My beautiful canapé was not a pretty sight by the time I reached home, they were overturned with the rosette a little bit squashed and a few of them got stuck together but they still taste as good and DinoBoy did not mind their appearance so long as he is able to eat them. DinoPapa tried one of it and he said its delicious. The chocolate cake is still in the fridge, its going to be our breakfast tomorrow. As for the baked chicken, we forgot to bring it out to eat during dinner so its going to go into the fridge too. I had a great experience at Creative Culinaire and it makes me want to attend more culinary classes in future. In my excitement I have forgotten to bring my own container for the food and I am not the only one too, Creative Culinaire is very thoughtful to provide us with plastic takeaway containers and plastic bags so that we can bring these delicious food home to share with our loved ones. I understand from Jasmine that most culinary classes does not provide such things and expect us to bring our own containers. 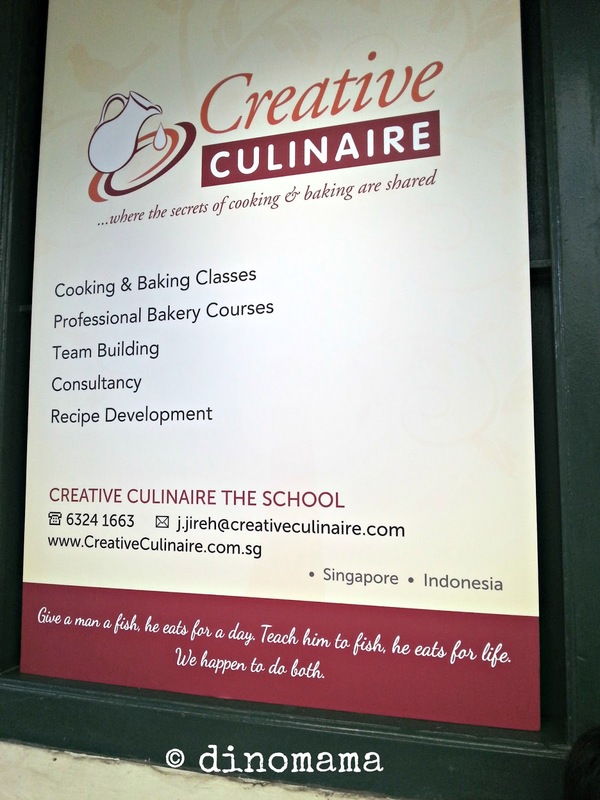 If you are interested to learn some cooking or baking, why not consider Creative Culinarie who conducts hands on classes at affordable prices? Check out their August 2013 class schedule and find one that fits into your schedule. 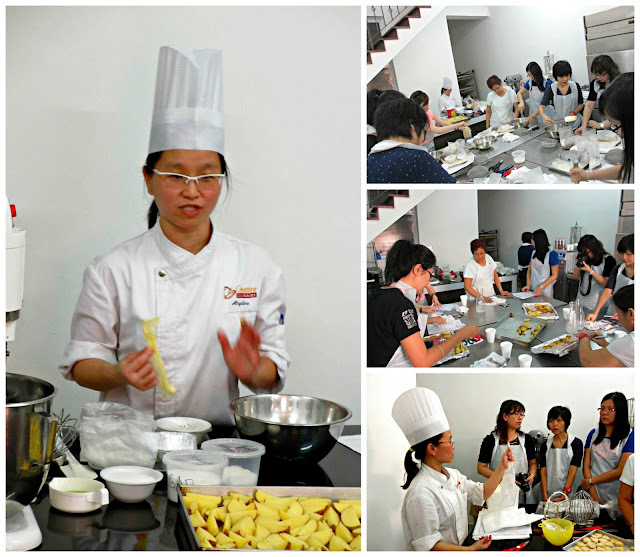 Their Traditional Mooncakes class on 24 August 2013 caught my eye, may be I will sign up for it. Besides this they also does customized cakes for every occasions, hop by to their website and see what else they can offer to you. 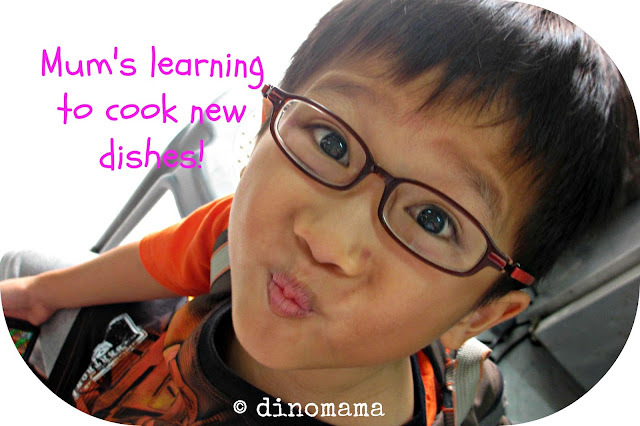 I am already thinking of letting DinoBoy join their September Kid's Class. This is such a lovely blog. Beautiful pictures, great design and so many groups you belong to! The Dino family keeps busy, I know! 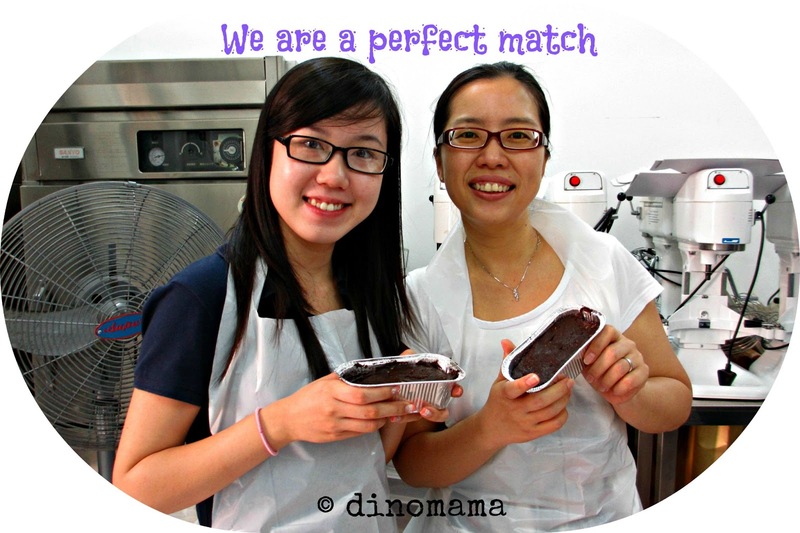 I have a friend in Singapore who has twin girls dinoboy's age. I am going to tell her about SMB. She will love it! Her name is Heather Hansen (find her on facebook. The cooking event looked fabulous! So fun! We are really a busy family Georgia~ Especially when you have a 7 year old who are always asking you "What can I do Mum?". Thanks for telling your friend Heather about SMB =) She will read about many fun, interesting and informative blog posts from our members. Great post! I loved your pictures and your comments about your experience during the cooking class. Even though I just had breakfast, you made me hungry again! Thank you for sharing. Jie Jie go your house teach dinoboy how to bake lah! You prepare ingredients, save your money a bit. you cook chicken for me, I bake cake and we can potluck. Hahahah.